On 22 July I was astounded to see a Swallowtail butterfly in a garden at Pointe au Sel. I am familiar with the other large butterflies in Seychelles, the resident Diadem and migrants African Monarch and Painted Lady, but this Swallowtail I had not seen in Seychelles before. My first assumption was that it must be a migrant, possibly a rarity. 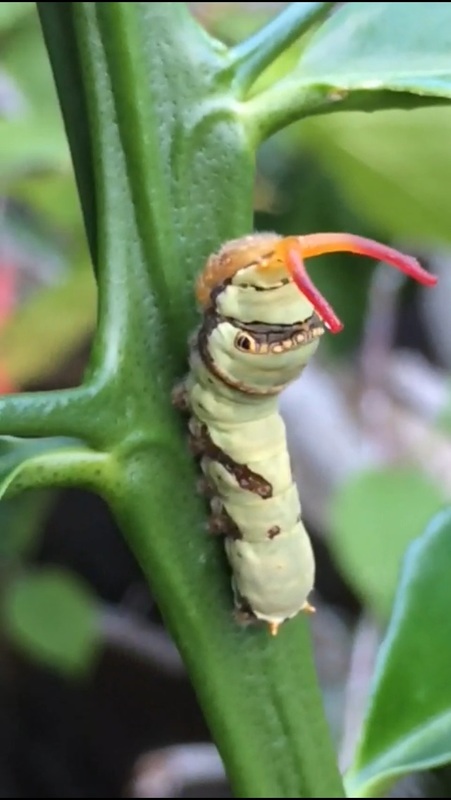 I mentioned it to Christine, who reminded me that she had seen and photographed a strange butterfly shortly before I arrived in Seychelles in late May, along with a large bright green caterpillar that she had found in her garden’s only citrus tree. Since my first sighting I have seen a Swallowtail on several more occasions in Pointe au Sel. An internet search led me to discover that Seychelles is claimed to have had an endemic Swallowtail species or subspecies, last seen in 1890 and presumed extinct. When I mentioned seeing a Swallowtail to various people, several of them had recently seen some of these butterflies. In an attempt to seek more information, I asked Pat Matyot, a highly knowledgeable Seychellois naturalist and co-author of “Lepidoptera of the Seychelles Islands”, if he was aware of Swallowtails on the islands. It turned out that he had written a letter to the local newspaper “Today in Seychelles” in early 2017, reporting what might have been the first sighting in November 2016. 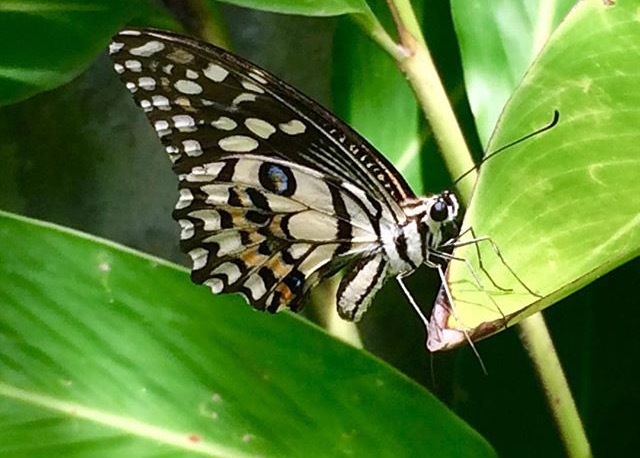 The species has now been identified as the Asian Citrus Swallowtail Butterfly, Papilio demoleus (sometimes called the Lime Butterfly or Lemon Butterfly). Pat’s letter intimated that the species might already have become established in Seychelles and the recent sightings in several parts of Mahe support this possibility. As its English name implies, the caterpillars are particularly fond of citrus leaves but they also eat leaves of karipile (curry leaf), Murraya koenigii, a plant that confers a wonderful aroma and flavour to curries in Seychelles and elsewhere. The Asian Citrus Swallowtail Butterfly is regarded as a serious pest in many parts of its distribution due to its caterpillar’s defoliation of trees in citrus plantations. Native to Asia from parts of the Middle East to India, China, Papua New Guinea and also Australia, this species is believed to have recently extended its geographical range to embrace the Philippines and several Indonesian Islands. Since 2000 it has become established on four islands in the Caribbean and in Portugal. And now it has reached Seychelles! Studies have shown that this butterfly can have nine or more generations per year, but that adults rarely live longer than 6 days. As our sightings of adult butterflies spanned over two months there must have been several individuals, and Christine’s photograph of a late-stage caterpillar conforms that it is breeding in Seychelles. How it got to Seychelles is unknown. Importation of eggs or young caterpillars on imported citrus plants is a possibility. However it arrived, inadequate biosecurity must have facilitated its entry into the country. The big question now is what to do about it. It is listed in the CABI Compendium of Invasive Species that threaten livelihoods and environments. Once biosecurity has failed to exclude an invasive alien species, the early stages of colonisation are the easiest and cheapest times to attack invasives, so early action is desirable. If timely eradication is not undertaken or fails, Seychelles might have acquired another invasive alien insect to accompany other recent arrivals such as the “senir plim” caterpillar and moth and the “together fly”, both of which have hit the local press through their widespread annoyance of residents and tourists. Although more decorative, the Asian Citrus Swallowtail Butterfly might yet prove to have serious consequences for some facets of Seychelles life.